If you received a bill and would like to take care of it, you can now pay through our website with ease of access! Please click the following office you received a bill from to directly pay your balance. We understand insurance benefits can be confusing and cause questions to arise. 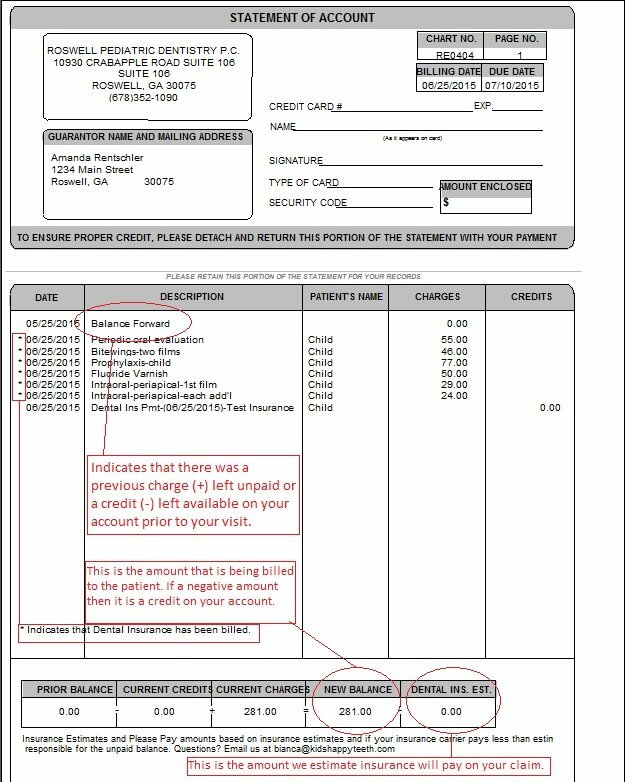 Majority of the time parents are issued a billing statement because their insurance has not covered a certain benefit that was recently performed in our office. The amount you pay in our office for any procedure is only an estimate of what the insurance will pay. We gather this estimate as a courtesy to our patients and any remaining balance will be their responsibility. If you are not aware of what dental benefits you have, we encourage you call your dental insurance plan so that we can better serve you. If you have received a bill, here are a few FAQ that perhaps will help answer your concern, if you do not see your question below, please call your office location, or email the designated office billing coordinator in the directory listed on the bottom of the page. I don’t quite understand the statement I received? 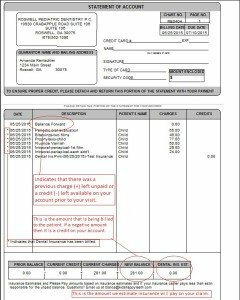 Here is an example of a billing statement from our office. We have labeled sections with explanations. I have called the office in regards to my bill; no one has answered or returned my call? In order for us to provide accurate information to any questions you have via phone call, we must first research the account and gather the necessary information. Our billing department encounters many questions on a daily basis; we are not always able to answer phone calls immediately. If you have just called the office and left a message, our billing department will return your message within two days, although we do make every effort to return all calls promptly. You can also reference to the email directory below to get in touch with the billing coordinator for your office location. Can I arrange a financial payment? We know how costly dental treatment and procedures can amass. We require our patients to first seek help from Care Credit. It is a healthcare credit line that only focuses on healthcare purchases. It can be used in any healthcare profession so long as they are participants. If you do not qualify, our billing coordinators will advise what you can do to take care of your balance. I have received a collections letter? If you have received a collections letter from one of our office locations, then you do have a balance on your account at that location. We always precede our collections letters with courtesy calls made to you. We send collections letters as a gentle reminder that you have a balance that remains unpaid. If you have received multiple letters and now have a letter stating that it is a Final Notice, then the account is being reviewed to be sent to a collection agency. We strive to offer the most up-to-date contact channels either by email, mail or by phone for questions and payments. Please call your office location or use the email directory below so we can further assist you. Our doctors are active members of the American Dental Association, and American Academy of Pediatric Dentistry. We accept most of the major insurance plans, Medicaid, and PeachCare For Kids. Check in our locations page for a complete list of accepted insurance plans.